Director Ana Lily Amirpour seems dead set on avoiding making definable movies. she follows her first feature, a "persian language vampire western" with a story of cannibalism in a post-apocalyptic dystopia, but without turning to horror tropes. The Bad Batch is dreamlike and fantastic without being unintelligible. It's disturbing and upsetting without being gory. She tells the story of a young woman making her way through an impossible world and she does it elegantly. But she may fail to invest us in that woman's story enough to take the journey as enthusiastically as she may need us to. I appreciated Amirpour's visuals. She finds this visual language of textures and light which is gorgeous to watch (like Ridley Scott's work in Thelma and Louise) and its necessary since the film isn't drowning in dialogue. Instead of through endless talking she tells her story through her characters' actions. Often those actions are horrific, but the other great strength of the film is how she doesn't dwell on it. Her gaze is far more interested in the impact of the events than in reveling in them. Unlike the kind of film making style where we witness the blood and gore, the horrific happens in The Bad Batch and the camera moves on, just giving us enough to understand, feel it, and wrestle with it. For example, I don't believe it is spoiling it to say the main character is captured by cannibals and they remove one arm and one leg from her for meals. The film doesn't linger on the amputations but spends a great deal of time in its story showing her walking on her prosthetic, improvising with one arm. The film is about consequences of horrible things, not the horrible things themselves and there is something incredible interesting about that. Another example is how we witness her murder someone, but the murder isn't a set piece to be ogled. But what comes out of that murder ends up being a major plot point. Amirpour seems interested in where things go after the horrors. She takes her time to tell her story, milking moments for their full range of emotions, often difficult ones. 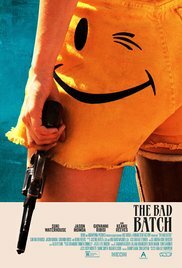 Where The Bad Batch falls down is that her central character isn't successfully compelling enough to carry through the length of the film. Amirpour has created this world and her vision for it is remarkable, but the heroine of this tale just isn't quite enough to get us into it. She rails against the world she is plunked into. "I want to be the solution to something" she says at one point. But her heroism is never crafted in a way we understand it. We are just to assume she is a good person without motivation. I feel people are being too harsh with Aminpour in their critiques of this film. But I admit that I didn't care enough about the main character and her journey to become too invested. Perhaps this is intentional. There is somewhat of a feeling that The Bad Batch is trying to be a "slice of life" sort of story set in this bedlam. Perhaps her central character and the folks she interacts with are supposed to be thinly drawn, unremarkable. There are characters introduced (like Giovanni Ribisi's character) who appear as if they should be more interesting than they are. But then they don't offer us much. Still, what kept me interested was Amirpour's approach to telling her story, how she eschewed the graphic features of living in anarchy for an exploration of what it feels like. There was a haunting feeling, not quite hopelessness but perhaps more of a purposelessness. The movie never answers the "why" and perhaps that is part of what I responded to, both in a desire for an answer and in the bittersweetness of not having it. Clearly this film is not for everyone but it's also not as remote as it appears. The Bad Batch is certainly more fascinating than most are giving it credit for, even if it's not perfect.